Most documents I have that refer to his birthplace merely say "Ireland." It is on only one document that Belfast, Ireland is mentioned. That document is the death certificate of his son, James Stead Todd. 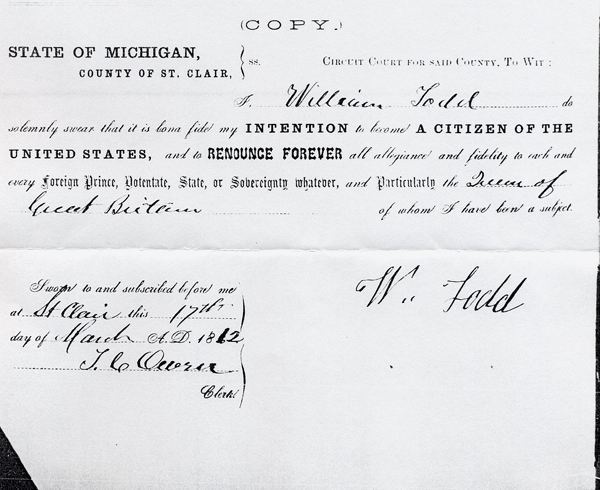 Additionally William's death certificate says that his parents were Nathaniel Todd and Miss Montgomery. No birthplace was given for either of them. Tests by Family Tree DNA have indicated that William was probably from Antrim County, Ireland just north of Belfast; however, so far, my research has been unable to identify his specific place of birth or who his parents were. One of the limiting factors is that his father's given name, Nathaniel, is a very common name in that area in the late 18th century as is his own name, William. Joined the church by profession of faith. According to an article on Samuel Patterson Todd, his family moved from Port Huron to West Bay City when he was six -- or 1870. Living at home of son-in-law, Arthur Mussen as is his son, Nathan. He is shown to be a widower. There is a record on the Elm Lawn Cemetery roster on the Bay County Genealogical Society's website that says his death took place on December, 13, 1904. [S18] Death Certificate, Death Certificate of Rev. John Todd. [S416] 1880 United States Federal Census, Fremont (Dist 7), Sandusky, OH Page 2. [S414] 1900 United States Federal Census, West Bay City, Bay, MI ED 62 Sheet 24. [S18] Death Certificate, Michigan Dept of Health, Office 3256, Register No 517. [S113] 1870 United States Federal Census, Bangor, Bay County, MI Page 38. [S416] 1880 United States Federal Census, Bay City, Bay, MI ED 9-22 Sheet 8A. [S205] 1886-87 Bay City Michigan City Directory. [S165] Death Record, Book E, page 170 dated December 23, 1909. [S24] Miscellaneous, Find-a-Grave email from Rosalie H. Kaufman dated 9/25/2011.